Marilyn and I invite you to visit our favorite place, our luxury oceanfront home-away-from-home at George Town Villas. This 2 bedroom, 2 bath condo is located near the south end of Seven Mile Beach. It boasts spectacular views, the privacy of a third floor unit and comfortable amenities. A covered patio with balcony overlooks the ocean, George Town Harbor, beach, pool and gardens. George Town Villas offers convenience to George Town, without the noise or tourist traffic, being set off from the main traffic arteries on aptly named 'Snooze Lane'. Several fine restaurants including 'The Wharf' are within a short walk, as are 'Seven Mile Shops'. A well-stocked supermarket is conveniently located within ~3/4 mile. The property itself is built around a large manicured garden featuring expansive lawns, palms and plantings. A well-maintained pool near the ocean/beach front is a favorite place for an afternoon visit while waiting for the elusive 'green flash' from the setting sun. For the more athletic, there are snorkeling and swimming off the beach. There is a tennis court on the property. Grand Cayman is famous for the clarity of its water, its magnificent reefs with hard and soft corals lining vertical walls, and abundant marine life. It is little wonder that it is a favorite destination for both new and experienced divers. Dive charters are readily available and most provide transportation from the condominium. For those who prefer fishing, deep sea fishing charters are available, offering full and half day trips. And for the horticultural enthusiast, the Queen Elizabeth Botanical Garden, located near the eastern end of the island is not to be missed. John is a physician and professor at the Medical University of South Carolina. Marilyn is a retired executive assistant. Both of us love scuba diving, and photography. First visited Grand Cayman on vacation in 2000 and had the good fortune to stay in a beautiful unit at George Town Villas. Enjoyed it so much that we decided to look for a property on the island. After much searching (at nearly every condo complex on the island), realized that George Town Villas was the right 'fit' for us, combining spectacular views, with convenience to George Town, shopping, and fine dining establishments. While convenient to main shopping areas, it is located off the main highway (West Bay Road) to avoid traffic noise and tourist pedestrian traffic. Views from the family room and patio, watching the ships in George Town Harbor, and the sunsets, which are often spectacular. An excellent shallow snorkeling location (wreck of the Gamma) is located a short walk south of the complex. With views of George Town Harbor, beach, and open sea. Easy access to ocean for swimming and snorkeling. Both bath and beach/pool towels are provided. Nearby World Gym fitness available within an short walk. Reasonable fees for daily or weekly access. Sofa, love seat, overstuffed chair. Coffee maker and coffee grinder. Limited to a few non-perishable items. Full kitchen with stove/oven, microwave, dishwasher, refrigerator. Cooking utensils/pots and pans provided. Indoor dining area seats 4 comfortably. A small library of paperback books. Large lawn with extensive and well-maintained plantings. Large pool deck with umbrellas/chairs/tables. Outstanding ocean views and excellent water access. Located at southern end of 7-Mile Beach. Condo is within walking distance of a number of restaurants including The Wharf (a popular high-end restaurant), a sushi restaurant, and a sports bar (Fidel Murphy's). A shopping area (7-Mile Shops) is close-by as is a fitness facility. A supermarket is about 1/3 mile away. Even though the condo is conveniently located to the above amenities, a rental car will enable access to many other restaurants and attractions. We thoroughly enjoyed our stay. This unit was well equipped and comfortable. Being on the third floor affords breath-taking views of the sunset and the water. 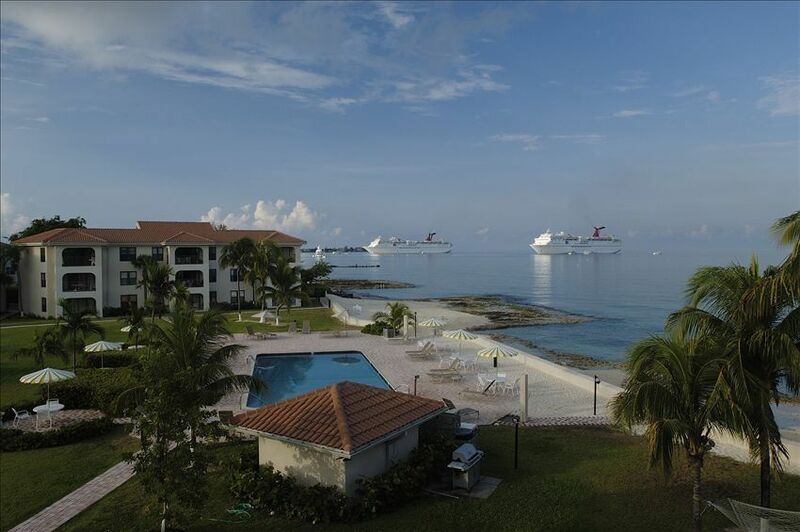 We look forward to returning to Grand Cayman and staying here again. The condo is in a great location. We prefer Georgetown to the more commercial 7 Mile. The view from the balcony is simply amazing. The pictures really do not do it justice. The condo complex and the grounds were kept immaculate inside and out. Snorkeling right in front of the condo was amazing. We were easily able to swim to the shipwreck just south of the property. I can’t really think of anything negative to say. I would definitely stay here again. Beautiful island and the condo is close to shopping and 7 mile beach. As others have indicated the property grounds are well maintained and the unit is clean. Very quiet condo complex, with beautiful views of the ocean and cruise visits. the home was clean and had everything necessary for a completely relaxing stay. my favorite place was the relaxing porch. It was nice to have wi-fi to watch a few movies, do homework, or catch up with work. My husband did the scuba that the owners recommended and it was great. Fish photos in the home were outstanding. We would love to return someday! thank you for sharing your unit. For selfish reasons, I really shouldn't review this... However, we cannot wait to visit again. The kitchen was well stocked with pretty much everything that one would need in the kitchen, there were plenty of towels and the rooms were spacious (even for our teenagers). We enjoyed cooking on the community grill, and swimming in the pool. Snorkeling was easily accessible with easy entry/exit on the ladder. The condo was close to Seven Mile Beach, grocery store and other amenities. Property manager and the owner were extremely responsive with any question we had or when we needed the temperature adjusted. We'll look for availability here when we return. I am a frequent visitor and this condo is my favorite! Always in great condition with everything you need. Can't beat the location. It is always good to have repeat guests!